Crisp, clean lines, elegant detail and full control of light and privacy make faux wood and wood blinds a popular choice. With an assortment of colours and finishes, faux wood and wood blinds are suitable for environments from rustic to elegant. Faux Wood Blinds are a great blind alternative. Wood-like in appearance, these 2″ blinds are available in many colours and finishes. 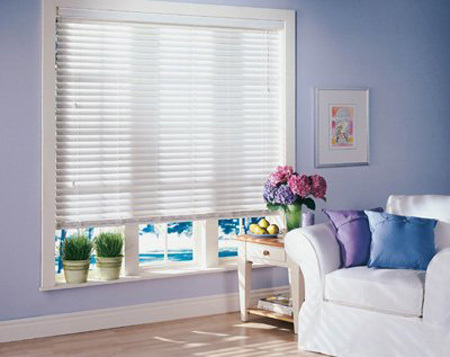 Designed to be used in any type of room, faux wood blinds are impervious to heat, humidity and moisture. Think it’s wood? It’s Faux – Noticeable by touch only! Bass wood blinds are made of the finest North American bass wood. There are two slat widths to choose from finished in paint or stain in the latest colour palette. Enhance your blind with cotton tapes or ProMark’s unique “Designer Series Tapes”.